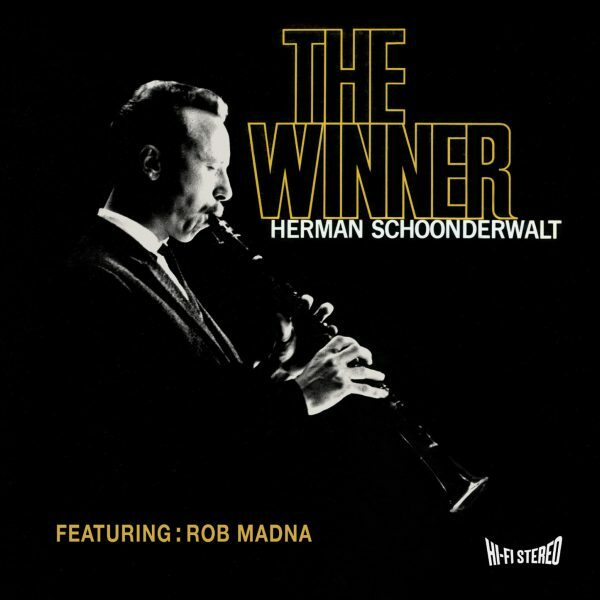 Herman Schoonderwalt’s album The Winner just sold over a couple of hundred copies in 1964, backed poorly by the Philips label. It has now been re-issued by the Dutch Jazz Archive and has found its proper place among the milestones of Dutch jazz. Abeautiful, lighthearted tone on clarinet, a desire to fly off the rail gently or with an edgy twist on alto saxophone. Melodic finesse, sustained momentum and evenly developed sentences. The Dutch jazz audience knows Herman Schoonderwalt (1931-97) as one of the great musicians from the Low Countries. But that his 1964 album The Winner, which was recorded after Schoonderwalt won the Wessel Ilken Prize and has been a treasured collector’s item ever since, is that good will surprise more than a few people. Schoonderwalt earned most of his money teaching and in show business, like so many European jazz men from the sixties and seventies, although Schoonderwalt did exceptionally well. Notwithstanding his extra-curricular activities, Schoonderwalt left an impression as an top-notch player to this day, a key figure in the influential Hilversum circle of straightforward jazz musicians who also played extensively in Boy Edgar’s Big Band and The Skymasters. The fifth in its series of Treasures Of Dutch Jazz, the Dutch Jazz Archive has done a wonderful job again, from the extensive, insightful liner notes to the remastering of the original master tapes from the Philips/Phonogram vaults. Heard in stereo for the first time, the various groups that Schoonderwalt used for The Winner and the bonus tracks (the icing on the cake consisting of Schoonderwalt and bassist Peter Trunk’s soundtrack to the Dutch movie Mensen Van Morgen as well as Schoonderwalt’s performance of Tadd Dameron’s Our Delight surrounding the festivities of the Wessel Ilken Prize) sound resonant and punchy, a real treat. Back cover of the album featuring pianist Rob Madna and drummer Wessel Ilken. Schoonderwalt’s compadres are excellent, responsive. Pianist Rob Madna, drummer Cees See and bassists Ruud Jacobs and Jacques Schols stand out as top European cats, playing tastefully and passionately. And Schoonderwalt rises to the occasion, flowing fluently through, among other tunes, the I Got Rhythm-changes of The Winker, weaving tenderly in and out of the cushion-soft brass and reed sections that arranger Rob Madna provided for the Miles Davis gem Nardis and elevating the old warhorse Ol’ Man River to a probing mid-tempo cooker. Cole Porter’s Get Out Of Town is a highlight, Schoonderwalt’s sensitive and sizzling lines pick up the band for a thoroughly swinging ride and make abundantly clear that he was one of the finest practitioners on clarinet of his day. A short while ago, just before the official release of The Winner, Flophouse heard alto saxophonist Benjamin Herman play the canny line of The Winker at club Pavlov in The Hague. A nice tip of the hat. Herman will be playing at a celebration of Schoonderwalt and release of The Winner at Amsterdam’s Bimhuis on December 17, which will also feature unseen footage and comments by longtime colleagues Ferdinand Povel, Jan Huydts and Schoonderwalt’s brother Rob. Recognition where recognition is due. And info about the December 17 CD Presentation here.